Kyabram Screenprint has been around for quite some time. 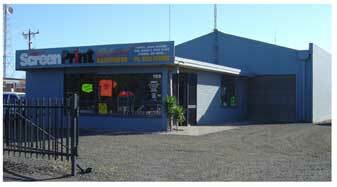 Our shop is loacated in country Victoria in a great town called Kyabram. We look after both local and national clients from this location. We have over twenty years under our belt in the design and print media industry. Janice also has designed work for national customers. She loves to win raffles and travel ...if she could! And does floors and windows. Daryl's background is in air brush and automotive art and is a dab hand in our digital printing and screen printing department. He also is the sign writer and the official hanger upperer. Daryl is an accomplished artist also, and together this gives us an ability to provide clients with unlimited choices when it comes to artistic style. Daryl's past life includes dairy farming, Car Shows, Builder of twoHot Rods (37' Chev ute and 34' Ford Roadster) and if you are in need of a decent set of flames for your car.... RING US!!! ......well enough about us. Have a browse over our website and if you need our services don't hesitate to contact us!